From the Baldwin County Courthouse, go east on Hancock St. and follow Highway 22 (Sparta Hwy) east for 2 miles. Turn left on Lake Laurel Rd. After 3 miles turn left on Jule Ingram Rd. Go 0.5 mile. On your left will be a faint woods road. Follow this road for 450 feet (past the ruins of a smokehouse) to an area on the left of the woods road, which is under some hardwood trees. 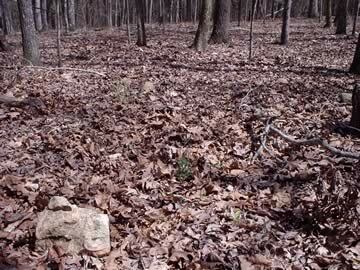 All that can be seen are fieldstones that indicate seven graves having paired headstones and footstones. 7 graves marked with fieldstone headstones and footstones.